Peri-implant mucositis is inflammation located to the soft tissues only. Signs and symptoms of the disease include bleeding on probing, increased pocket depth, swelling, discharge or suppuration and radiographs show no evidence 1of crestal bone loss. 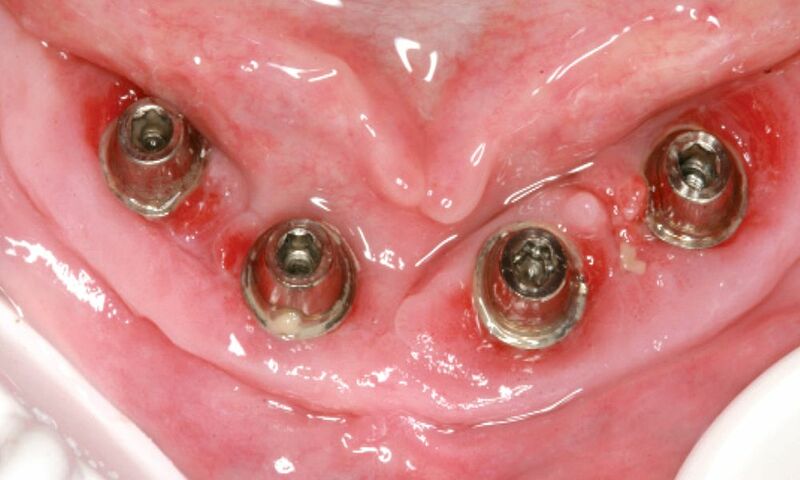 Peri-implant mucositis is reversible whereas peri-implantitis in not. The ADI has developed and published useful Guidelines on the Diagnosis and Management of peri-implant disease. Please see the ADI website for more details. Peri-implantitis is an inflammatory process affecting the tissues around an osseointegrated implant in function, resulting in the loss of supporting bone. The clinical features of this process may involve clinical signs of inflammation, but the diagnostic feature is the crestal bone loss. Radiological evaluation is a useful tool in the assessment of peri-implantitis, but due to projection artefacts often underestimates the size of the defect. False negatives are also a problem as the radiographs can only show the mesial and distal bone but not the labial or lingual bone surfaces that are masked by the implant body. It is therefore recommended that peri-implant probing is essential in the diagnosis of this condition. A probing force of 0.25N is recommended. As we have discussed, probing around an implant allows the early detection of peri-implantitis which is vital in both its treatment and mitigating further disease progression, it is however a technique sensitive investigation and care must be taken not to probe the implant shoulder. A key diagnostic feature of inflammation is bleeding on light probing. Mobility is a terminal stage of peri-implantitis, and careful diagnosis is required as other causes of implant mobility are more common, in particular mobility or fracture of the superstructure. Pain is not normally a feature and frequently the patient is unaware of any problems. Peri-implantitis is an infectious disease and therefore it is important in the differential diagnosis to exclude other causes of inflammation, the most common being retained cement, or cementitis. It is also imperative not to confuse the normal physiological remodelling of bone due to surgical trauma which can occur for up to one year post placement, with this disease process. There is considerable evidence that the aetiology is of a bacterial nature, and the majority of studies suggest that teeth and implants share risk factors, the most important being poor oral hygiene and smoking. The bacteria typically have a low pathogenicity without invasive properties; they are not aggressive and produce low chain polymer substances that contribute to the biofilm. The infections tend to chronic, evade the hosts defence mechanisms and tend to be localised to a specific site not becoming systemic. A dental implant is a type 3 medical device as it crosses the epithelial barrier into a non-sterile environment. Exposure to micro-organisms is therefore inevitable and colonisation of the sterile implants surface will occur. Normal implant flora’ is compatible with health, however ecological factors that promote an unwanted shift in resident flora are to be avoided. One Cause For Two Diseases? The arguments for this concept include the common microbial and clinical features, along with common risk factors (smoking, genetic factors and poor oral hygiene), and the higher incidence of peri-implantitis in patients with a history of periodontal disease. The counter argument is that periimplantitis is also seen in patients with no history of periodontal disease, and the disease is defined by the site rather than the pathogen. It is suggested that the following scheme is adopted, it must be noted however, that the most important clinical feature in the diagnosis of peri-implantitis is the peri-implant probing depths. 2) Are there clinical signs of inflammation? 3) Are there pocket depths >3mm? 4) Does the pocket extend more than 3mm beyond the implant shoulder? 5) Is there bone loss? 6) Is there a plausible cause other than peri-implantitis? 7) Is the pocket deeper than 5mm? The most important aspect of the treatment is to clean the implant surface. The ability to be able to do this depends on the implant type. Rough surface implants cannot be cleaned effectively with mechanical methods alone. It is important to realise that this is not a ‘disease of the bone’. The process starts in the connective tissue, on the smooth surface with a biofilm, then the rough surface is affected. The associated bone loss is a result of this process. There have been six systematic reviews analysing the treatment of peri-implant disease. These studies all present many approaches and protocols for the treatment of peri-implant disease, however they present little evidence to support one particular method. The unpredictable nature and limited longterm reports of success would explain the varied approaches. The literature suggests a number of key objectives in the treatment of peri-implant disease. These are to remove aetiological factors, infection control, debridement and decontamination of the implant surface and regeneration of the lost support. The literature also suggests that there are essentially two approaches to treating peri-implant disease; surgical and non-surgical. Both of these approaches may be supplemented with treatment to remove aetiological factors, oral rinses, and systemic antiboitics. The ADI have developed and published a comprehensive set of guidelines, together with simple-to-follow algorithms for the treatment of peri-implant disease. These can be found on the ADI website.